On October 16th, 1964; a basement in Berwyn, Illinois played host to four schoolboys, guitars, drums, and their dreams. From that meeting sprang platinum hits, Grammy awards, and a common bond that has lasted ever since. The IDES OF MARCH mark a rare milestone in any partnership, let alone rock and roll; they have remained together, with all the original members intact for fifty years. 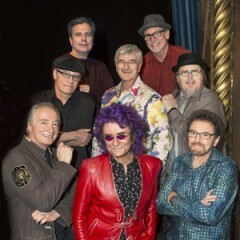 Best remembered for their 1970 smash “Vehicle”, the IDES (or their lead singer and songwriter Jim Peterik) have had hit records in each of the decades since that humble beginning. From the Brit-meets-Chicago Soul of their 1966 debut “You Wouldn’t Listen” to the rousing sports anthem “Finally Next Year” that cheered the Cubs throughout their red-hot 2003 season, the IDES have combined shimmering vocal harmonies with their trademark driving brass section to forge a sound that is timeless and unforgettable. This isn’t a sedate “oldies” act-much the opposite actually. In concert, the IDES OF MARCH remain a vital, powerhouse rock and roll band whose typical 90-minute concert usually lasts two hours, and the encores are always the strongest songs of the night. The secret of the band’s longevity might rest in the fact that they all have remained best friends throughout the years, with not a hint of ego-trip to be found. This is especially unique because singer Jim Peterik rose to the top of the heap with his band Survivor (“Eye Of The Tiger”) during the 1980’s. Jim also co-wrote the multi-platinum hits for Southern favorites .38 Special (“Hold On Loosely”, et.al.). When Survivor ran its course, Jim returned “home” to the IDES, and the band never looked back. While many “vintage” groups supplement their sets playing “cover versions” of the hits of others, the IDES celebrate Jim’s “extracurricular” hits like they were “homegrown”, which they, in some respects, are. At their 50th year together, the accomplishments and accolades continue to accumulate. The band was honored by their hometown of Berwyn, Illinois by declaring the street running in front of their High School “Ides Of March Way”. A close relationship with the Pastor of Chicago’s Holy Name Cathedral has instituted a tradition of featuring the Ides singing at the Christmas Eve Mass. The Ides have sung their thrilling rendition of our National Anthem for The Chicago Cubs, Bears, Bulls, Fire and White Sox with over 35 visits to Comiskey Park/US Cellular field. (The Ides sang the last home game at the “old” Comiskey Park, and the first night game at the “new” one!). The Ides tunes have never left the airwaves on classic rock and oldies radio, but with the rise of music and dance competition TV shows, “Vehicle” has found a brand new audience-most notably on “American Idol” where Bo Bice rode the song to the final show, which led to his version earning the song another Platinum Award to accompany the original. You can also hear “Vehicle” regularly on commercial soundtracks, and it is in regular rotation on the playlists all of the nightly talk shows’ house bands. The Ides also have undertaken a new role as educators, with Jim Peterik heading a songwriting/performance seminar that is available in tandem with Ides concerts. Attendees to these exciting events learn the ins and outs of creating Platinum hits, and some of the arcane secrets of holding a band together for so many years. The Ides have also begun to give back to the community. “A Vehicle For Education”, a non-profit organization, has been established to award scholarships to deserving students who excel in the Arts. The first grants have already been awarded. The Ides “Vehicle” remains in overdrive, with no signs of slowing down. The band is hotter than ever, thrilling audiences in every city they visit. They are true gentlemen, taking the time to greet every fan who wants a picture or autograph after the show, leaving good vibes in their wake. At most every show, tales are heard of folks driving hundreds of miles just to attend their concerts. They say they don’t make ‘em like they used to, and that is certainly true for the Ides, who were “made” in a diﬀerent time, but choose not to mellow with age, but forge ahead on a path of progress. You’ll see as many Gen-X and Gen-Y denizens rocking and dancing at an Ides show as Baby Boomers. Great music and great performance have no expiration or “sell-by” date. The Vehicle rolls on!